You may choose to include a Segway Rotterdam event in special celebrations such as anniversaries, birthday parties and family outings. Splashtour can also be added as an excursion. You can also choose one of the various Segway Rotterdam combination packages for your family outing. A family outing with Segway Rotterdam can be expanded with a number of combinations and arrangements. Lunch, dinner, high tea or coffee with cake are offered at Restaurant De Zwarte Zwaan. The restaurant is located directly adjacent to the Segway Rotterdam departure area at Parkhaven. In addition, Segway Rotterdam offers arrangements and combinations which include the most exciting attractions in Rotterdam. The ideal family outing in Rotterdam starts with Segway Rotterdam. You will never miss the boat with Segway Rotterdam. 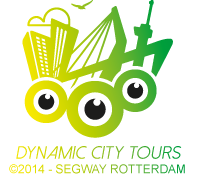 Segway Rotterdam has special rates for private bus charters. Visit www.zwartezwaanevents.nl for even more water adventures! Zwarte Zwaan Events caters to every imaginable water adventure for outings, ranging from a single event to a complete arrangement. Excursions range from a unique tour of Rotterdam to action and sensation, and from exciting games to meeting arrangements. Zwarte Zwaan Events works with every group and budget.